When you set foot aboard our state-of-the-art 100-passenger Celebrity Xpedition in the Galapagos Islands, be prepared for an experience like no other. Filled with indulgences, including room service, in-suite dining, massage services, complimentary plush bathrobes, a fitness room, nightly lectures by certified naturalists from the Galapagos National Park (who are on board during your entire vacation), and live music in the Discovery Lounge, you’ll experience the Galapagos Islands in style. Celebrity Xpedition‘s small stature means she is perfect to visit the smaller ports and towns of the gorgeous Galapagos Islands. 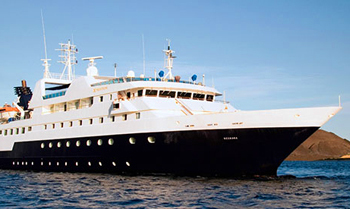 Her seven night Galapagos cruises operate year round and depart from Isla Baltra. View all Celebrity Xpedition cruises, view a selection of Celebrity cruise deals, or view more options for Celebrity cruises. Recount the days activities with new friends over a refreshing drink and live music. Soak in spectacular views of the sunrise or sunset, the choice is yours.